The sources of funding covered include the ECO, London Energy Efficiency Fund (LEEF) and the Social Housing Fund. Download the guide here. potential for wind energy in London; the human contribution to climate change; Nissan Electric taxis‘; emissions from electric vehicles; promoting community energy through planning; Mayor’s briefing to the House of Lords on the Energy Bill; Mayoral visits to the Dagenham wind power project; RE:NEW programme advice on supplier switching; supplier switching advice; Nuclear power and London; bills savings achieved by households under RE:NEW; the Mayor’s energy advisor’s visit to New York; the Mayor’s energy advisor’s visit to Rio de Janeiro; the Mayor’s view on wind farms; London Energy Efficiency Fund (LEEF) Advisory Committee papers; nuclear power value to Londoners; roll-over energy contracts for SMEs; CO2 savings achieved under RE:NEW; the Mayor’s energy advisor’s visit to San Francisco; the Mayor’s view on MASDAR’s investment in the London Array; the Mayor’s view on shale gas; investment opportunities for London through financing wind power projects; hosting a London ‘Climate Week‘; RE:NEW advice supplier switching; renewable electricity supply to the Tube; SOURCE London charging points; London’s need for more electricity substations; completion of Affordable Warmth and Health Action Plan; applications to the London Schools Hydrogen Challenge; budget allocated to the Mayor’s new Affordable Warmth and Health Action Plan; the Mayor’s new Affordable Warmth and Health Action Plan; Londoners supported through the Mayor’s Know Your Rights helpline; GLA officers working on the new Affordable Warmth and Health Action Plan; RE:NEW report backs; Benefit Entitlement Checks (BECs) under RE:NEW; carbon offsets for flights; key activities in the Mayor’s new Affordable Warmth and Health Action Plan; private sector funding leveraged by RE:NEW; targets under the Affordable Warmth and Health Action Plan; community level responses to heatwaves; disseminating research undertaken to date on how to cope with heatwaves and the health impacts of cold homes. June 2013: A recent question to the Mayor helped highlight the first investment made by the London Energy Efficiency Fund. LEEF was established in November 2011 and has £100m to invest in energy efficiency retrofit to public sector-owned / occupied buildings, and has to be fully invested by December 2015. The fund is a sub-set of the London Green Fund which is itself made up of £50 million from the European Regional Development Fund (ERDF), £32 million from the London Development Agency (LDA), and £18 million from the London Waste and Recycling Board (LWARB). The European Investment Bank manages the London Green Fund on behalf of the GLA and LWARB. Of the £100 million, £50 million has been allocated to an LEEF which has been match-funded with a further £50m by the Royal Bank of Scotland (RBS). 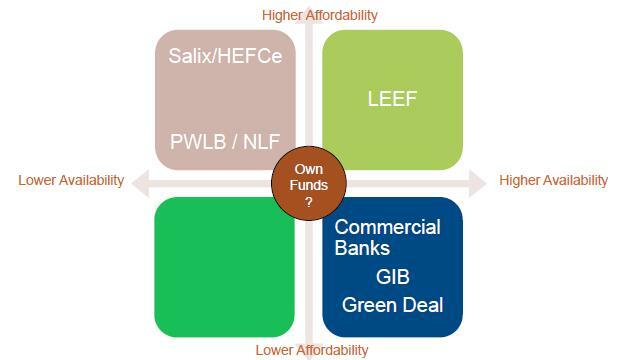 An outline of how the fund operates is set out below. Further information is set out in the environmental statement published as part of the Tate’s planning application for the extension here. How will the £100m London Green fund benefit the capital? Tomorrow’s meeting will take place on Thursday, 10 January 2013 from 10am in the Chamber at City Hall. Members of the public are invited to attend. The meeting can also be viewed via webcast. June 2012: Details around additional funding being directed by the Mayor into the London Sustainable Industries Park (LSIP) has been released. It states that the “delivery of the LSIP will also be a significant milestone for the Mayor’s London Green Fund which has approved investment of £9 million into an Anaerobic Digestion Facility to be delivered on the LSIP.” LSIP – based around Barking and Dagenham – is being developed on 60 acres of land owned by the GLA and is at the heart of the Mayor’s Green Enterprise District. Additional information is set out in the London Riverside Opportunity Area Planning Framework. Carbon savings achieved under RE:NEW; the number of homes treated to date under RE:NEW; timetable for the formal evaluation of RE:NEW; access to the the Mayor’s climate change strategy data; the use of the London Energy Efficiency Fund to support energy efficiency in social housing; data on achievements under RE:NEW; information on Phase II of RE:NEW and also delivery of the programme to older people; the Centre for Carbon Measurement; the Mayor’s commitments to his environment commitments; details on whether the Mayor will update other London environment strategies; the number of homes which will not reach the Decent Homes standard by April 2015; the funding of Decent Homes now it has moved under the Mayor’s control; Hybrid Buses target as set out in the Mayor’s Electric Delivery vehicle plan and the number of buildings treated under the RE:FIT programme. January 2012: The £100m London Energy Efficiency Fund (LEEF) is a new source of funding for energy efficiency retrofit on public sector buildings in the capital. Following its launch in October 2011, the LEEF team have been holding ‘drop-in’ sessions for potential applicants to discuss the suitability of their project to the fund.